Join this 200-hour yoga teacher training course in Nepal to bring your practice to the next level and become a professional yoga teacher, internationally recognized! You can deepen your spirituality and energize yourself on all levels of yoga retreats with Mandala Studio Yoga & Spa, the one and only school in Nepal to learn authentic yoga with more than 15-year experience expert. With a mix of teamwork and different professional experienced yoga teacher, it is a perfect destination to experience the power of yoga, spiritually and scientifically. Learn yoga during unique classes and training with the professional experienced teacher, they will bring you the wisdom and knowledge of thousands of years traditions! They teach 200-hour YTT according to the standards of the World Yoga Alliance. Suitable from beginners to intermediate, this YTT is an authentic, spiritual & scientific yoga training program that will fully prepare you for your yoga teaching career. 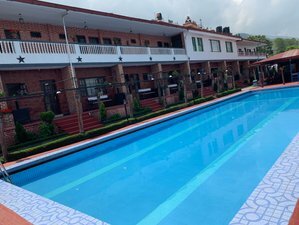 The course takes place in a beautiful Nepali traditional guest house where you will stay in lovely, eco-friendly accommodations situated amidst acres of blossoming gardens, Swimming pools, hiking trails, the mountains, the forest, the hills, and absolutely breathtaking views from the rooftop. The guest house is clean with all amenities for your comfort; clean bed sheets, towels, AC, TV with English channel. 24-hour free WiFi, Swimming pool, own attached bathrooms with hot and cold water, balcony, and very helpful staff. The rooms are big with coffee table, bamboo and wood sofa and chair, wood cabinet, mirror, a single bedroom, double bed, or group occupancy. The yoga class run outside the door and indoor. Mandala Studio is proud to be the first Yoga Academy certified by the government of Nepal and accredited by World Yoga Alliance for all levels. Independent reviews confirm that our efforts to deliver the best yoga teacher training pay off. Today, we are focusing more on bringing the best quality YTT and preparing our students for real lie. Our teachers come from a traditional yoga background. Classes are conducted by experts from Nepal, India (chief guest) and partly by an international guest teacher. The organization believes in teamwork rather than just giving a course by a teacher. Their goal is to develop mutual understanding and bond between people who come to them for yoga. They have a highly qualified professional expert yoga teacher who undergone two years to receive a Master (M.A) in Yoga and is P.H.D holder from the international level. This ensures that the knowledge delivered to you is wide-ranging from theoretical to practical applications, and you understand the correlation of yogic science and the human body. Our aim is to provide authenticity and tradition as well as a modern and dynamic approach to yoga. We follow the teaching method of Gurukul Kangari University (107 years old Yoga University at Haridwar in India). In the theoretical part, you will build a solid base in the yoga field, you will chant mantras every day, you will learn philosophy, meditation practice, and techniques, pranayama, how to teach different types of yoga and how to create great yoga sequences, etc.. You will leave our yoga teacher training fully confident and ready to start your yoga teaching! Upon successful completion of the course, the trainees will receive a professional certificate of International Yoga Teacher recognized by World Yoga Alliance which is valid all around the world. Trainees will be able to start teaching yoga immediately after completion of the course. We prepare our students to be ready to start teaching the beginner & intermediate level of different yoga style sequences like a professional yoga teacher. training which cover physical & mental stress managements. 06:30 - 08:30 Satkarma, Pranayama, Bandha, Mantra, Vinyasa flow. 16:00 - 18:30 Hatha yoga practice. Every Friday and Monday Kundalini meditation practice, Satsang, dance bhajan kirtan etc. All yoga materials are available in the studio but if you prefer to practice on your own mat, you can bring your own mat or buy a new one. You don’t need special shoes as classes are solely barefoot. There will be a one day trip to Osho Tapoban Ashram. According to the course, you will practice Dynamic meditation there. You also will do sightseeing around Kathmandu valley. Kriti Karki is the owner and the instructor of Mandala Studio Yoga & Spa. Kriti was very young when she suffered from serious asthma and she recovered after her father (Dr. SB Karki) decided to teach yoga, meditation, and breathing exercises to her with the practice of healthy yogic food routine. Since then, Kriti has developed the penchant for yoga and making it a daily routine. Yogacharya Deependra Bhatt was awarded a scholarship for Masters degree in Yoga Science, from Haridwar, India (2012-2014) against my service. Also, He worked for the Department of Research on Yoga Philosophy and was responsible for providing data of Ancient Yoga scriptures from Department of Archaeology, Kathmandu. It helped him understand better Yoga and he always wanted to be a Yogi. Swami Basu Samarpan is a spiritual seeker and a Reiki master and also yoga and meditation instructor who is a unique and ordinary human soul with all the gifts of nature. He has completed his master degree (M.A.) in Buddhist religion and philosophy in first degree honor from the Tribhuvan University (T.U. ), Kathmandu, Nepal, and has been awarded to his many social activities. And as a Buddhist scholar, he is also contributing to share Buddha’s message through different means and ways. A yogi's diet is built around eating to nourish the body and having a healthy relationship with food. We supply a yoga diet which consist of food grown naturally and harmoniously with nature and seasonable fresh vegetables and fruits. The philosophy stems from the idea that food is the creator of prana (life force), which sustains the physical body and mind. The yogic food is all vegetarian because it simplifies the development of sattva, which is the concept of ahimsa (non-violence). The food is prepared with love, peace, gratitude and positive intention, in order to increase and sustain prana. If you have special dietary requirements it's a good idea to communicate it to the organizer when making your reservation. Below activities are available in Mandala studio yoga and spa with special price for the YTT participate students. Below activities are not available in mandala yoga studio but they can arrange all those activities programme upon your interest and request. All these activities should be done before or after the course, during the course you can do short activities programme in your free time and off day. Please note that all these extra activities cost extra charge. There will be a 20% discount for additional spa service. For more information, ask your questions directly to Mandala Studio Yoga & Spa, who will be happy to assist you. Simply click on the Send Inquiry button to send a message. 21 nights accommodation with a hot and cold shower. Once you arrive at Tribhuvan International Airport (KTM), Mandala Studio Yoga & Spa representative will be waiting to pick you. Mandala Studio Yoga & Spa is the first yoga studio in Nepal which is signed in the CTEVT program guaranteed by the government of Nepal. This yoga teacher training is available from January to December and starts on the first day of the month.